Not really. But if Earth's history was placed on a calendar with each day representing about 10 million years, human history so far would begin at 11:59PM and end at midnight tonight. From January to March not much happens, because our clump of space dirt was hot and dry. But as it cools and collects water from comet impacts it doesn't take long for life to get a metaphorical toe hold. The first single cell microbes appear in early April, with small multicellular clumps forming later in the month. Such bacterial mats are still found on Earth (and probably will be found on other planets too, as we may soon find out). 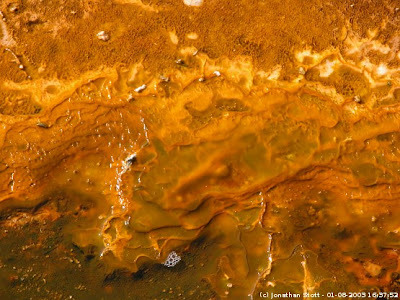 Here's an image taken by Johnathan Stott of a bacterial mat found in boiling water at the Old Faithful Geyser Basin, Yellowstone National Park. In May—on our year-long Earth history calendar—vertebrates emerge as fish. Slowly life on land evolves into plants and begin to cover the globe in July. In mid-September fish crawl up on land and early reptiles preview the dawn of the dinosaur era, which continues through late November. Birds and small shrew-like mammals first appear in early November, but are overshadowed by reptilian species until early December, when the dinosaurs disappear abruptly, in a few hours on this scale. By late December, the recognizable ancestors of modern mammals make their debut. Today, New Years Eve, things start to get busy, but it's not until noon that our first distant ancestors appear. Then tonight, between 9:30 and 10:00 pm, Homo Sapiens migrate out of Africa to populate Eurasia and the Americas.